New remix contest by Pest Control Records and Radio Magnetic. Remix the track “Plug Jamming” and win digital release. As always…Good luck!! We’re pleased to welcome back those pesky Pest Control boys onto Radio Magnetic. They’ll be bringing their show back on a fortnightly basis with their brand new balance of banter and bangers. Techno, acid, Italo and the like will be the order of the fortnight. 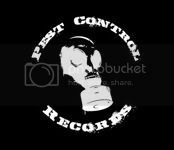 Before the first show’s up on the site we’d like to offer you the chance to remix a track on Pest Control Records. Marcus Rafferty’s digital EP, was released yesterday and Pest Control are offering you the chance to remix the monster that is Plug Jamming. The winner of this remix competition will have their remix released digitally in early 2010 on the label. You can stream Marcus’ original recording here (scroll to the bottom of the page to the soundcloud link) and also download the individual parts to create your very own re-interpretation of this fine tune. Keep the bit rates of submissions to 260 kbps or less please – the winner will have a higher quality mp3 when it’s released of course. The Pest Control team and all at Radio Magnetic are really looking forward to hearing your efforts. Good luck.